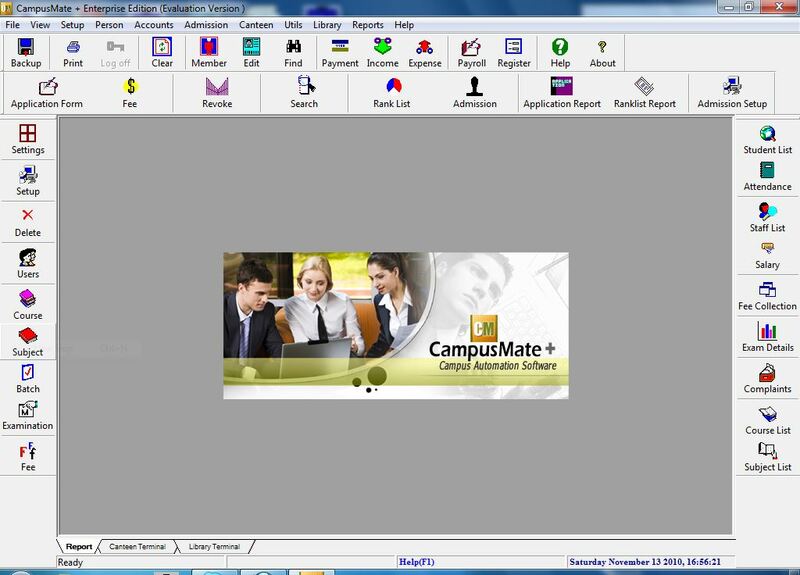 CampusMate is a Set of Software Packages developed for the smooth functioning of Educational Institutions. The design of the system such that the product follows a plug-in architecture for both Online as well as Offline Campus Mate + Framework. The Offline framework is called OfficeMate and Online module is called WebCloud. Both these frameworks are in near production phase. The add-ons currently developing include Library, TimeTable, admission, canteen, store, Lab, swipe card/attendance , event Management, CCTV Surveillance etc modules. OfficeMate offline module incorporates various main modules like Person Information, Department , Attendance, Fee etc information which will be available to all the add-ins using the exposed COM/ .NET interface libraries. KTS WebCloud online module incorporates a framework in which we can add n number of menus and pages dynamically and various master page layouts. The system also incorporates a powerful plug-in framework so that we can add additional modules as add-ons to this already developed Website framework without recompiling the main source base. This will result in greater productivity in and in reduced project cost.